Jennifer Kerns explains how a modest budget shouldn’t limit a garden center’s capacity to expand brand awareness. It’s a fundamental concept: people won’t come to your business if they don’t know your brand or what you can do for them. Marketing is a crucial part of any successful business venture, especially for independent garden retailers. Many businesses consider marketing a costly and complicated proposition, but marketing consultant Jennifer Kerns works with companies hoping to raise their marketing profile without breaking the bank. Kerns delivered a talk during Cultivate’17 about cost-effective methods for marketing on a limited budget, and spoke with Garden Center magazine to extrapolate on these ideas. GC: For our readers who didn’t attend Cultivate’17, could you give a quick gist of what you discussed during your talk? JK: At Cultivate, I wanted to convey to small business owners that they could take away some great lessons and ideas from what major brands are currently doing for their marketing strategies. You might be a small business with limited resources, but that doesn’t mean you can’t do marketing like the major retailers out there. You can learn a lot from Costco, Nordstrom, Maytag and other major retailers, even with a small staff and limited marketing budget. I covered tips and tricks to improve sales without a huge investment. GC: Even when a business has difficulty finding room in its budget for a marketing campaign, why do you think it’s important to still have a coherent, modern strategy? JK: It is so important to have a coherent, modern marketing strategy as you need to be continually monitoring your industry and your target audience. With the development of online shopping and at-home delivery services, consumers have more options than ever before. It is easy to not be brand loyal anymore, as there are so many options for what they need available with just a click of the button. You need to stay in the forefront of your target audience’s minds and continually find ways for them to pay attention to your company. And then there is the educational element that comes along with the green industry. New generations want to get involved with plants, but they are afraid of failure. It’s up to you to educate them and give them the confidence to try. If you just sit back and wait for people to come to your business without engaging them, you will lose them to your competitors. GC: Are there low-cost marketing tools and resources available to businesses that they may not be aware of? JK: Of course, I always mention social media as a very cost-effective tool to help your business gain more recognition. It costs nothing to set up a Facebook, Instagram, Twitter, YouTube or LinkedIn account. You can also request control of your Google business location page and post updates there for free. The key to any of these is to pay attention to it. You can’t just create a Facebook page and expect people to automatically come. You must engage in social media by always posting relevant news, responding to comments and injecting fun into it. The best news is that the green industry is so visually vibrant, so there is always something that can be posted and promoted. Many will say that they don’t have time for social media, but your social media accounts can be managed by multiple people, so you can share the load. Ask your employees to help with developing fun posts. I’m sure a lot of you hire Millennials, and they are perfect helpers when it comes to social media. Give them the task of coming up with fun ways to showcase your business on social media. They will be excited to help as well as become a more engaged employee for you. Get your customers to help with your social media, too! Create photo opportunities at your business and customers will post for you. That’s an effortless way to get a free marketing boost on social media. You can also run photo contests to get people to tag you in more posts. Get creative and have fun with it! Advertising on social media is also very affordable and easy to do. Gone are the days of long-lead times and high design costs for newspaper and magazine ads, as you can easily create your own ad on Facebook or Instagram. You can choose your target audience, budget, timeframe and more, all within a few minutes. Then it’s easy to monitor to see how your ad campaign is performing every day. If it’s not giving you the results you want, just stop it. If you like the results, it’s easy to extend it. Another low cost option: ask your suppliers! Many of your plant and product suppliers have marketing tools to help you sell. If you sell more, then they sell more, so of course they want to help. Reach out to your vendors and ask what they can do for you. GC: Garden centers have specific strengths that other retailers may not. Do you have any tips particularly for specialty/horticulture retailers like independent garden centers? JK: 1. Signage. Ever notice the elaborate displays and signage in grocery stores? Those are there to grab your attention and help sell more of that product. Garden center retailers need to be thinking in the same frame of mind. Make sure your signage is helping you sell. About 68 percent of consumers believe that a business’ signage reflects the quality of its products or services. Think of your in-store signage as your silent salespeople. Although it can’t verbally interact with your customers, it can communicate messages and make a sale as well as your employees. We all know you are busy during the spring rush and your employees might not be able to help everyone, so let your signage sell for you! 2. Superior Customer Service. Providing a superior shopping experience makes all the difference in making a customer return and be your brand advocate. The big box stores can’t provide the customer care and knowledge you can, so use it to your advantage. Make your shopping experience fun and relaxing. Messy stores take away from the fun. I went to a garden store this past spring to shop and there were plants shoved in every nook and cranny. Plant racks were blocking tables so you couldn’t see all your options and the aisles were narrow, making it hard to navigate around other people with a cart. You want your in-store experience to be welcoming and inspiring; not chaotic and overwhelming. 3. Incorporate Samples. Have you ever shopped at Costco? I urge you to check it out and see how successful they are with their free samples carts stationed around the store. According to Dan Ariely, a behavioral economist at Duke University, “Reciprocity is a very, very strong instinct. If somebody does something for you, you really feel a rather surprisingly strong obligation to do something back for them.” Sales of products jump 300 to 600 percent when samples are offered. So how can you do samples in a garden center? Show off fun recipes that you can make with fresh garden ingredients. Make a flavored water refreshment stand and highlight the ingredients used, create a fun salsa recipe and have an end-cap display showcasing the plants customers need to do it at home. When you show people how easy it can be, they will get inspired and try new things. Ask your suppliers for samples. Again, if you can get your customers to buy more, then they sell more too, so they want to help in any way they can. GC: Any final thoughts on marketing with a limited budget or anything else you’d like to mention? JK: Never grow complacent in your branding and marketing. Take time at the end of each busy season to analyze how your marketing programs helped your customers, as well as discuss fresh solutions for them. Continually look for ways to improve and offer your customers not only the best plants, but the best shopping experience. Offer to go the extra mile for your customers. It’s worth it. When a drought hit Connecticut, contractors looked to traditionally drought-stricken areas for solutions to the problem. It’s not drawing as much attention as drought worries in California, Texas or Florida, but a lack of water significantly hit a pocket of the Northeast that’s never experienced the problem to this degree before. In the summer of 2016, most of Connecticut was under a drought watch for the first time, and the restrictions were finally lifted in mid-June. Bruce Moore Sr., president and CEO at Eastern Landscape Management based in Stamford, Conn., says less rainfall, combined with average snowfall and an increase in population, has created the perfect conditions to start a drought. Whether it’s a random occurrence or a sign of something bigger, customers are finally coming around to the idea of water conservation, or at least, more open to it than in the past because of the drought and water rates increasing. “There’s more concern because the weather patterns seem to be changing,” says Maki, whose company services residential customers. Moore says the drought has made his customer base, which is 100 percent commercial, start to come around to being more responsible with irrigation. Moore estimates interest in water-efficient technologies has increased 50 percent compared to five years ago. While rainwater catchment systems haven’t been very popular with Connecticut residents, customers are more open to drought-tolerant plants and water-efficient technology. Though the drought watch is over, residents are being asked to continue to water efficiently. The rule as of July 2017 is you can only water two days a week, but Moore says that is not a sustainable regulation. Moore describes his area of Southwest Connecticut as the “Gold Coast of the East,” with some very large estates that consume hundreds of thousands of gallons of water over the course of the summer. “You’re not going to get total compliance,” he says. Moore and Maki have both kept their eyes on what contractors are doing in states that have experienced serious drought problems. Moore hasn’t had to rip out turf, but native plants are now a more popular option along with increased interest in drip irrigation and remote sensors. “If we can get people to use the smart controllers and selecting proper landscape plants, maybe even cutting down turf areas — a lot of things they’ve done out West — that will bring the water usage down on its own,” Moore says. Eastern Landscape Management has been promoting the use of perennial plants in areas like parking lot islands instead of having plants that would need water or could get damaged in winter months. Maki has talked to contractors in Texas, because they are much more advanced in dealing with drought, and he’s learned to try new turf types. Moore has suggested to property owners that they should have a second water meter installed that only measures irrigation water. With that installation, a property manager can subtract the water used for irrigation off the sewer tax bill because water for irrigation doesn’t go into the sewer system. Once the irrigation water use is documented, property managers can subtract that from the sewer tax bill. If you only have one meter, all the water used is calculated into the bill. “By having a separate water meter, they can say, ‘Okay, we use X amount of gallons for landscape irrigation,’ and they’ll let you subtract that off the sewer tax bill,” Moore says. Along with offering smart controllerS and drip irrigation, Eastern Landscape Management has offered water audits to customers for years, but was met with little interest. The company would check the type and size of nozzles being used and then calculate the run time. Moore says even though they charge for the audits, more property managers are open to it. While customers are increasingly receptive to paying for water efficiency, there are still options they aren’t buying. Moore says customers still don’t have an interest in retrofitting old irrigation systems. Glen Gate has sold a few rainwater catchment systems, but Maki says the return on investment still isn’t there for most. He says the systems would be sold more on the idea of being environmentally friendly rather than a money-saver. But Maki says the rule to only water twice a week may result in better looking yards since a lot of people overwater their plants. “It’s not just good for drought, but good for plants,” he says. “You’re doing things the smart way.” And while no one wants to be part of a drought, the rule has raised awareness for those who may have never thought about conservation before. Brian is editor of sister publication Lawn & Landscape magazine. It may seem like California is not longer in a drought, but that’s not actually the case. Even though drought conditions have improved in California, the state is not entirely of the woods, and may not be for a long time. Sister magazine Lawn & Landscape spoke to Sandra Giarde, executive director of the California Landscape Contractors Association, to see how contractors are approaching the issue. Lawn & Landscape: What is the current status of the drought in California? Sandra Giarde: Contrary to what is being depicted in the media, the drought is not over for all of California. The most recent data (June 13, 2017) shows that 23.5 percent of California is still in drought status. The impacted areas are largely in Southern California and include some of our largest counties (San Luis Obispo, Santa Barbara, Ventura, Kern, Los Angeles, Riverside, San Bernardino, Orange, San Diego and Imperial counties). The Sierra Nevada still has incredible snowpack and that will filter down through our water aqueduct system to Southern California but it may not be enough. L&L: How are your contractor members approaching irrigation right now? SG: Our contractor members are still practicing proactive water management whether that be through selection of drought-tolerant, native plants or through water budgeting or by utilizing water-efficient irrigation technology. Many are approaching the notion of smart landscape water usage as a long-term strategy, given California’s past history of droughts. As noted above, a quarter of the state is still in drought status, so it would not be a good time to ease up on being smart about landscape water usage. L&L: What is your advice to companies in areas of the country that don’t normally get hit with a droughts? SG: 1 — Examine the irrigation system. Is it modern and up to date or from 15-20-plus years ago? Updating the irrigation equipment could help achieve some big savings, especially if you focus on irrigation practices that reduce evapotranspiration. 2 — Switch out parts of the landscape to incorporate plants and turf that use less water, yet still look nice. 3 — Stop overwatering. So much of landscape is overwatered. Our landscape contractor members share a familiar lament: they put in a new, efficient irrigation system and properly program the system for appropriate and efficient water use only to find that the property owner’s weekly gardening service comes in and reprograms it to overwater the entire landscape (trees, turf, flowers). And then the property owners get angry when their water usage hasn’t dropped. Property owner education is the first step in combating such a problem but it has to be accompanied by a watchful eye on the irrigation system and who is adjusting it. L&L: Any other news in your state concerning irrigation? SG: The big piece impacting landscape contractors and landscape architects is the Model Water Efficient Landscape Ordinance (MWELO). MWELO was recently updated and being implemented throughout the state with local planning departments adopting the new water use law and its various pieces. MWELO covers a wide range of practices that are designed to improve efficient landscape water use like plant selection, plant water use ratings, soil testing and management, revised irrigation design and installation requirements, water budgeting and more. CLCA has been holding MWELO training throughout the state with more planned this Fall because it is not a question of “if” this is going to be adopted in your community, but “when” and our members need to be ahead of the curve on this. Professor Dr. Tim Rhodus explains what it took to implement the new technology into OSU’s plant trialing program. For the past three years, Dr. Tim Rhodus, a professor at Ohio State University’s Department of Horticulture and Crop Sciences, has assisted his colleague, Dr. Claudio Pasian, in running Ohio State’s annuals trial. To help attendees better interact with the trial, Rhodus developed an app that allowed visitors to walk through the gardens and evaluate the trial from a smartphone or tablet. For this year’s trial, Rhodus wanted to take digital interaction with the trial to a new level. During OSU’s spring semester, he was teaching his students about virtual reality (VR) using Google Street View. In his class, students had to create 10 VR tours consisting of photos of Ohio State’s campus and locations they consider important. Then, the students had to make an introductory video for their virtual tour and package the entire project on YouVisit.com, a cloud-based virtual reality hosting website. It was this project that spurred Rhodus to develop a VR trials tour. Work started in the middle of May and was completed by summer, when OSU’s trial was opened to the public. As an undergrad at Bowling Green State University in Bowling Green, Ohio, Rhodus received a business degree. From there, he worked in a commercial greenhouse for four years before receiving his master’s degree and Ph.D. from Ohio State’s Agricultural Economics Department. After receiving tenure in 1994, Rhodus switched his entire focus to websites and utilizing the internet. “I decided I wanted to go in a new direction and that was the time that the World Wide Web was being developed, as were virtual browsers and then setting up a server,” he says. He and a team built PlantFacts.osu.edu, which Rhodus says was the first internet search engine strictly for horticulture in the U.S. Extension communication websites were indexed, as was an early image database. Both projects were funded by the United States Department of Agriculture’s (USDA) higher education challenge grants — a program that “involves a creative or non-traditional approach toward addressing that need,” according to the USDA. In his classes, Rhodus aimed to show his students that there was more than just word processing and PowerPoint on computers, particularly in horticulture. When he was interested in a new development, he’d find a way to work it into the class. VR also happens to be a longtime fascination for Rhodus. In 1996, using QuickTime VR 1.0 software from Apple, he made a VR catalog with 50 cultivars in it. It was not until recent technology improvements that VR could be used beyond the original endeavor. The VR trial shows the viewers each plant’s genus, name and breeder when it appears on the screen. Rhodus used his class’ project as a trial to see if using a VR display could work for tours. What he found was that he could, but that it would require using different software. So, instead of using YouVisit, the trial VR was put on its own server and built using software to digitally stitch photos together and another program to build navigation tools. 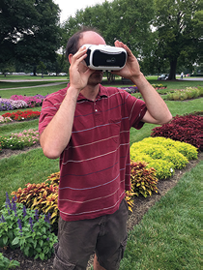 Attendees can view OSU’s plant trial using a computer, smartphone or VR headset. The trial itself took four or five days to build — one to take all the photography, another three or four to construct the VR. After some adjustments, the VR trials were made headset-friendly just before it was launched. The entire trial consists of more than 400 cultivars with 224 available in the VR trials. When using it, viewers can rotate the screen 360 degrees to see the entire garden. And when a specific plant appears on the screens, its genus, name and breeder are shown. In short: The entire VR trial garden is accessible to anyone anywhere in the world, so long as they have access to the internet. There are aspects of the VR trial garden Rhodus wants to improve — namely, he’d like to speed up the building process and then showcase different days of the trial — but he sees this year as the first step toward something new. The VR trial gardens can be viewed at bit.ly/2fvBich.